Eritrea’s recent foreign policy shifts have been driven by President Afwerki and his Red Sea allies. Neither has an interest in Eritrea democratising. 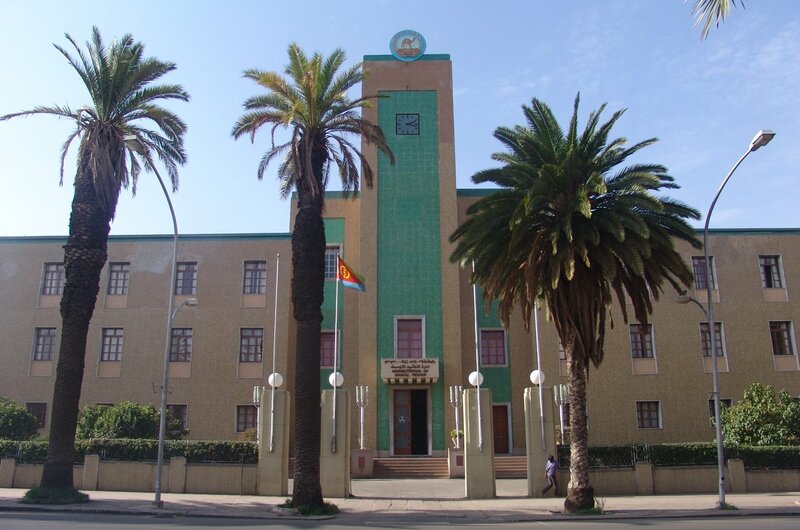 Eritrea’s government building in Asmara. This is the fifth part of The Thin Red Line, an African Arguments series focusing on dynamics around the Red Sea. Over the past few years, alliances and rivalries across the Horn of Africa have shifted significantly. This is perhaps nowhere clearer than in Eritrea, which has embodied the truism that counties have no permanent friends or permanent enemies, but only permanent interests. Recently, those interests have led Asmara to make peace with Ethiopia after twenty years and improve its relations with others in the region. These breakthroughs have led to hopes that the government may soon enact long overdue reforms at home. After all, for two decades, its oppressive behaviour and economic woes have been blamed on hostility with Ethiopia and living a “bad neighbourhood”. A closer look at the factors leading to Eritrea’s changing relations, however, dampen these expectations. In the first few years of independence in the 1990s, Eritrea built its foreign ties on principles and loyalties. Though not always completely consistent, it shunned governments that had supported its rival liberation movement as well as monarchies or Islamist regimes deemed to be a threat. Following the 1998-2000 border war with Ethiopia, these determinations quickly shifted. Tensions with neighbours Ethiopia, Djibouti and Sudan ratcheted up, while relations with the West took a turn for the worse. Under this growing international isolation and domestic pressure, foreign relations became more pragmatic. The goal became, first and foremost, about regime survival. President Isaias Afwerki thus looked to cut deals with a range of other powers looking to extend their influence in the region. These partnerships range from China and Russia to Israel, Iran and Libya. From the mid-2000s, however, Qatar became particularly crucial to the maintenance of Afwerki’s increasingly repressive rule. The small Gulf nation provided essential and extensive financial and military assistance and became the Horn of Africa country’s most important economic partner. In the early-2010s, this close relationship started to fray. Afwerki was reportedly angered by Qatar’s attempts to tame his recalcitrant behaviour and break Asmara’s long-running impasse with Ethiopia. He was additionally alarmed at the Gulf nation’s catalysing role in popular uprisings in the 2011 Arab Spring. Eritrea therefore took the opportunity of increasing interest from Saudi Arabia and the United Arab Emirates (UAE) to shift its alliances. In 2015, it signed a security partnership agreement allowing the UAE to build a military base in Assab for its war-effort in Yemen. Afwerki’s new allies agreed to provide significant financial aid, build infrastructure in Eritrea, and increase fuel supplies to the country. Eritrea provided land, airspace and also reportedly deployed around 400 of its own troops to Yemen. Saudi Arabia and the UAE quickly became essential partners as Eritrea switched allegiances. The extent of this change was clear in the 2017 Gulf crisis when the government threw its weight behind the Saudi-led camp in its attempts to isolate Qatar. In the last couple of years, Asmara has also given the cold shoulder to this bloc’s regional rivals. It has cut off military and diplomatic relations with Iran, whose nuclear programme Afwerki had publicly defended in 2009, and snubbed Turkey in its attempts to extend its influence in the Horn. At the same time, Afwerki has visited Egypt, an affiliate of the Arab axis, on several occasions and supported Cairo in its diplomatic row with Ethiopia and Sudan regarding the Nile waters. All these foreign policy changes have been significant for Eritrea. But perhaps the most momentous shift has been its rapprochement with Ethiopia after twenty years of hostility. Beginning this June, the two neighbours ended their long-standing stalemate and promised to open a new chapter of peace. This understandably rocked the region. The conflict has cast a shadow over the Horn of Africa for two decades. Ethiopia has used the dispute to encourage others to isolate Eritrea. Meanwhile, Afwerki has used Ethiopian hostility as a pretext for widespread prohibitions on freedoms, the banning of the free press, and the imposition of indefinite military service at home. Following the announcement of peace, and Ethiopia’s calls for the UN to lift sanctions on its neighbour, it was understandable that many were excited an opening up of Eritrea might be in the offing. However, there are reasons to be sceptical this change is coming. Change abroad, change at home? Firstly, this development is related to Eritrea’s broader relations across the Red Sea, and therefore the dynamics and interests these contain. As documented in the Thin Red Line series, the Red Sea has regained its geopolitical significance recently with rival powers scrambling for strategic footprints on the sea’s western shores. Different competing blocs have built allegiances – bolstered by attractive economic deals – from Egypt down to Somalia, gaining leverage over many of their new partners. Some African countries, most notably Ethiopia, have been able to stay independent in the face of this attention, but others have struggled. Eritrea has clearly thrown in its lot with the Saudi bloc to which it is reliant and indebted. These patrons, however, have little interest in Eritrea undergoing reforms, which might risk its internal instability. After all, the Gulf’s engagement is not based on principles but self-interest. For various reasons, a rapprochement between Addis Ababa and Asmara was deemed to serve these interests; Emirati leaders notably met with Ethiopia’s Prime Minister Abiy Ahmed and President Afwerki on several occasions in the run-up to the announcement of peace. But democratisation in Eritrea is unlikely to. In fact, the opposite may be true. In this way, Eritrea and Ethiopia’s peace can be seen as part of wider Red Sea dynamics, rivalries and interests being projected onto the Horn, which are more likely to raise tensions in an already volatile region than encourage democratisation. Secondly, the reality is that as long as Afwerki remains at the helm, it is difficult to see genuine reforms happening. For a whole generation, the president has suspended Eritrea’s democratisation and cracked down on any dissenters in order to maintain his rule. Former foreign minister Petros Solomon, a member of the G-15 opposition who disappeared in 2001, once claimed that Afwerki’s foreign policy was erratic and that the ministry’s main job was simply to do damage control. But this underplays the underlying logic of the president’s approach to foreign relations, which has mostly been about his own survival. Previously, hostility with Ethiopia served this purpose. Under new circumstances, Afwerki has deemed that a UAE-brokered peace is advantageous. But the ultimate motivation is the same. Eritrea’s lucrative alliances with powers across the Red Sea may have precipitated some sweeping changes in its foreign policy, but they have also bolstered the president’s position domestically. In fact, rather than pushing for change, they have given him a new lifeline. Afwerki’s new partnerships have allowed him to avoid the economic and political liberalisation that Western donors or continued misery might have demanded, and they have fortified his security and military base against direct threats or internal demands for reforms.